Today is the third Sunday of the month, and that means it's time for Vintage Garage, the monthly all-vintage marketplace that takes place in the parking garage at 5051 North Broadway. There are 75-100 vendors every month, and there's all kinds of vintage. This month the theme is Vintage Clothing and Rockabilly. Vendors are bringing their best clothing and 1950s rockabilly items, along with their regular selections. In a very modern twist, Vintage Garage now accepts Litecoin, the cryptocurrency! Owner Melissa Sands said in a statement, "Litecoin is easy to accept, cheaper to process, and very secure, which were all important factors in deciding to integrate it. We like to say Litecoin allows us to Buy the Old With the New!" Entrance to Vintage Garage is $5, and it runs 10am-5pm. 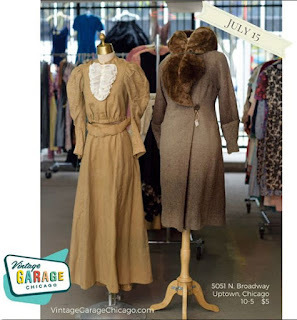 Next Vintage Garage is on August 19th, when the theme will be Vintage Weddings.